Pregnancy is a phase which brings in a change- Physically, Psychologically and Spiritually. Often, it so happens that the moment a woman gets to know that she will be a mother, there is a slow paradigm shift, subconsciously, from herself to her child. Emphasis is given to the baby's health and wellbeing. As a result of hormonal changes a pregnant woman goes through a series of emotional upheavals and changes in her physiological health. Management of these upheavals will be much easier when the ‘parents-to-be' balance the focus between the mother, father and their baby. While many men today want to share as much as they can in pregnancy and birth, they may also feel somewhat daunted at the prospect of actually fathering an infant. Moments of being touched by feelings of joy, pride, and awe may conflict with feeling trapped by the pregnancy, disturbed by the changes in his partner's pregnant body, and fearful of this unchartered territory he is entering, and of whether he can provide financially. Becoming a father is a major transition in a man's life, yet, his roles during pregnancy is pivotal in fostering the wellbeing of his partner and the unborn child, and his own future role as father. The focus of family and friends can be exclusively on the mother and the baby. Bridging this gap is an essential factor to promote a bonding between the father, mother and the baby. A couple may undergo a series of feelings, which are seldom expressed. This lack of expression may lead to small arguments, disagreements and so on, making life difficult. The emotional challenges of pregnancy will inevitably impact a couple's relationship. For both partners, having a baby will engender a wide spectrum of feelings--from being consumed with fear to being overwhelmed with gratitude and love. ‘He' may experience ‘her' as totally preoccupied with the unborn child, unpredictable and irrational. ‘She' may see ‘him' as unsympathetic and unavailable. She may not notice the depths of the emotions that he too, may be experiencing. He may be feeling excluded, unappreciated, and resentful, guilty for feeling that way, and opt to withdraw rather than engage in his role as father and lover, protector, and supporter of his partner and their unborn child. The unborn baby responds to the sounds and emotions of the parents. 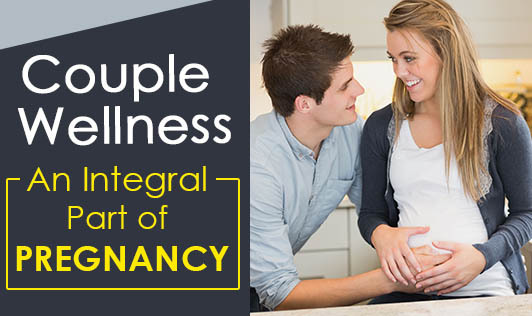 The couple can explore together how they can foster a nurturing emotional atmosphere that will communicate to their unborn that he/she is safe, welcomed, and loved. They can practice Yoga and meditation together. This will enhance the wellbeing of the couple as well as their bonding. His expressions of love to the mother will nourish his baby as well. Her expressions of love to him, will assure him that he is integral to, not apart from, this experience of birthing and nurturing a new life. Parenthood is a journey that takes you deeper into the sea of family, and bonding is an integral part of it. Spending quality time with each other is the key to wellness in this phase, make the most of it.